-Telefonica’s commitment to transforming the network from copper to fibre represents an energy efficiency of more than 85%. -Telefónica is already 100% renewable in Germany, Brazil, Spain and the United Kingdom, thus approaching its goal of being renewable in all countries by 2030. Telefonica’s commitment to transforming the network from copper to fibre represents an energy efficiency of more than 85%. 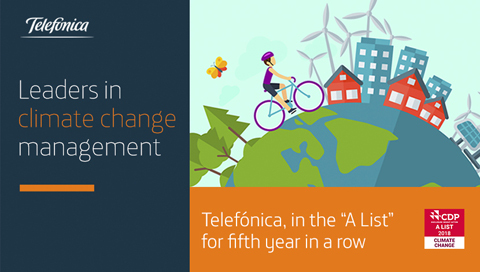 Telefónica has been recognized as a leading global company in the fight against climate change and included, for the fifth consecutive year, in the “A-list”: https://www.cdp.net/en/scores drawn up by CDP, the non-profit organization that annually compiles and distributes this information to investors, corporations and governments. “Managing climate change is a priority for Telefónica. More than 50% of the electricity the company uses today comes from renewable sources. We have stabilized our energy consumption despite traffic having increased by 107% in the last three years, improving our efficiency by 52%. And we have achieved all of this two financial years ahead of our planned goals. In other words, we are more efficient and we are also consuming increasingly greener energy each year”, explains Enrique Blanco, Global GCTIO at Telefónica, who recalls the commitment made by the company to lead the transformation of the network from copper to fibre, which represents an energy efficiency of more than 85%. Telefónica, the only Spanish Telco in the list, is working to have a more efficient telecommunications network in the market in terms of energy and CO2 and is helping develop a low-carbon economy with a more intensive use of digital solutions. These services allow reducing our customers’ emissions. Annually the company prevents more than 900,000 tons of CO2, which is equivalent to more than 70% of its own footprint. That’s how it is approaching carbon neutrality and continues to make progress towards the aim of preventing more emissions than those produced. Paul Simpson, CEO of CDP, highlights the importance of acting against climate change because the severity of environmental risks for companies is becoming more evident. “The A-list companies are positioning themselves to offer solutions, take advantage of new market opportunities and thrive in the transition towards a sustainable economy. We need to urgently scale environmental actions at all levels to fulfil the Paris Agreement and the Sustainable Development Goals”.